Contract signed, now contractors have to get going, because the project has extremely tight time frames. Delivery set for August 31, 2016, while official opening will take place in September. 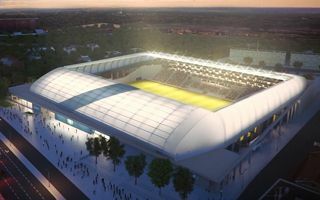 Today the contract for MTK Budapest new stadium was signed. It’s the third major sports stadium in recent months to be built in Budapest. Ferencvarosi new home is already operating, while the old national stadium was closed for reconstruction in recent weeks. The selected contractors are Z-W MTK Konzorcium, which consists of two major construction companies: ZÁÉV Építőipari and West Hungária Bau. The project will cost less than previously expected. Instead of HUF 6.5 billion it will cost exactly 6,310,503,818 forints (€20.3m / $22.4m). This still represents a high price compared to planned capacity of under 5,500 spectators. However the stadium will have a huge number of skyboxes, currently set at 41. That’s more than many stadia of 30,000 capacity can show. The project has a very tight schedule. Handover to the investor is planned for August 31, 2016. Meanwhile opening game will be played on September 21. Thankfully the former Nandór Hidegkuti Stadion was fully demolished in the summer and land is prepared for works. Most of the new stadium will be prefabricated, so progress should be visible on a daily basis.